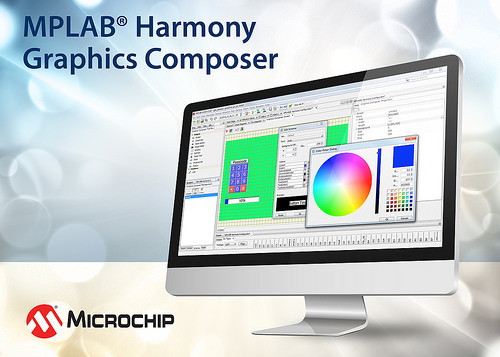 Microchip announces MPLAB Harmony Graphics Composer, a free development tool for engineers to easily develop and design professional graphical user interfaces. 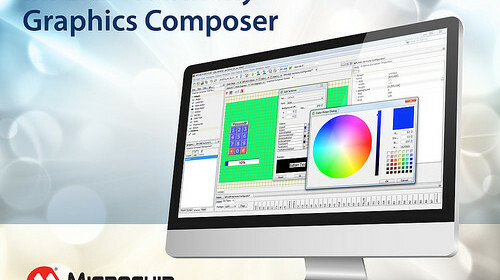 Microchip Technology Inc. (NASDAQ: MCHP), a leading provider of microcontroller, mixed-signal, analog and Flash-IP solutions, today announced the MPLAB® Harmony Graphics Composer (MHGC), a modern and flexible graphical user interface (GUI) composer tool. MHGC is a free development tool for developing GUIs for all PIC32 microcontrollers through Microchip’s Harmony Configurator and MPLAB X Integrated Development Environment (IDE). The software allows anyone to create branded content using the Harmony Graphics Library, in conjunction with their custom assets, to create GUIs in a What-You-See-is-What-You-Get (WYSIWYG) design model, without complex and cumbersome coding. Microchip is launching a new development board called Curiosity for 8-bit PIC lovers. It supports 8-, 14-, 20-pin 8-bit PIC® Microcontrollers with low voltage programming capability and has an integrated Programmer/Debugger with USB Interface that is fully compatible with Microchip’s MPLAB X development environment. Your next embedded design idea has a new home. Curiosity is a cost-effective, fully integrated 8-bit development platform targeted at first-time users, Makers, and those seeking a feature-rich rapid prototyping board. 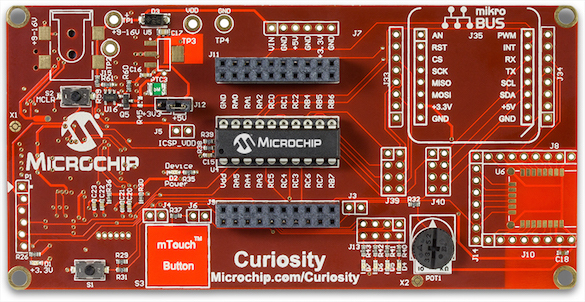 Designed from the ground-up to take full advantage of Microchip’s MPLAB X development environment, Curiosity includes an integrated programmer/debugger, and requires no additional hardware to get started. Also, check out Mike Szczys‘ (over Hackaday) reviews of this new PIC development board here. Microchip Technology has announced the second member of its award-winning and patented GestIC® family. The new MGC3030 3D gesture controller features simplifies user-interface options focused on gesture detection, enabling true one-step design-in of 3D gesture recognition in consumer and embedded devices. Housed in an easy-to-manufacture SSOP28 package, the MGC3030 expands the use of highly sought after 3D gesture control features to high-volume cost-sensitive applications such as toys, audio and lighting. 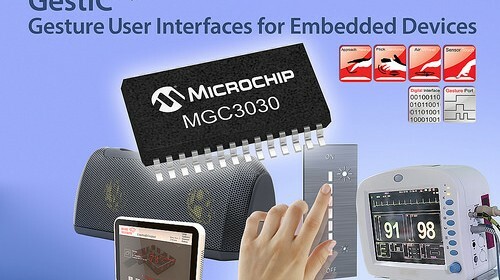 The simplicity of gesture-detection integration offered by the MGC3030 is also achieved through Microchip’s free, downloadable AUREA graphical user interface (GUI) and easily configurable general purpose IO ports that even allow for host MCU/processor-free usage. 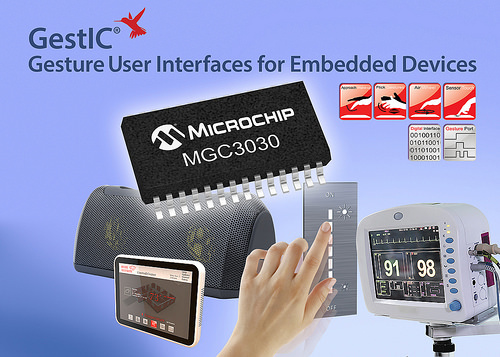 The MGC3030’s on-chip 32-bit digital signal processor executes real-time gesture processing, eliminating the need for external cameras or controllers for host processing, and allowing for faster and more natural user interaction with devices. 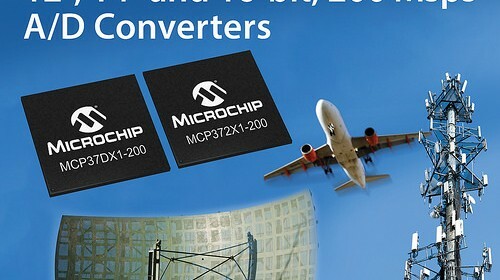 Microchip Technology Inc. has announced two families of new high-speed A/D converters in the MCP37DX1-200 and MCP372X1-200 families. These families feature 12-, 14- and 16-bit pipelined A/D converters with a maximum sampling rate of 200 Mega samples per second (Msps). The 14- and 16-bit devices feature high accuracy of over 74 dB Signal-to-Noise Ratio (SNR) and over 90 dB Spurious Free Dynamic Range (SFDR), while the 12-bit devices have 71.3 dB SNR and 90 dB SFDR. This enables high-precision measurements of fast input signals. These families operate at very low-power consumption of 490 mW at 200 Msps including LVDS digital I/O. Lower power-saving modes are available at 80 mW for standby and 33 mW for shutdown. The MCP37DX1-200 and MCP372X1-200 include various digital processing features that simplify system design, cost and power usage for designers. These families also include decimation filters for improved SNR, individual phase, offset and gain adjustment and a fractional delay recovery for time-delay corrections in multi-channel modes. Data is available through the serial DDR LVDS or parallel CMOS interface and configured via SPI. 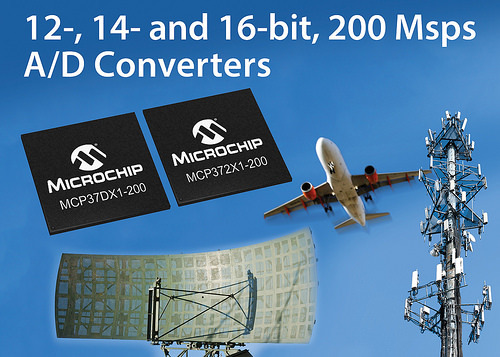 An integrated digital down-converter is included in the MCP37DX1-200 family making it ideal for communications applications. The 12-bit families include an integrated noise-shaping requantizer, which enables users to lower the noise within a given band of interest for improved accuracy and performance. These families are targeted for applications in the communications markets such as base stations, test equipment, and IF receivers, among others.